It’s getting a bit chilly in NYC. As the weather begins to shift, I start to think about creating. New books. New recipes. New opportunities. But let’s focus on the recipes for now. With fall right around the corner, I get in the mood to create new dishes. I was thinking the other day that it would be nice if I took my barely used crock pot off the shelf and made a hearty dish. What type of dish? Well, I didn’t get that far in my thought process. I immediately remembered the never been used bread maker my parents so graciously gifted me for Christmas a few years ago, after hearing me say that I wanted one, that’s sitting in the box. I hope my mother doesn’t see this post! I’m good for buying kitchen gadgets that don’t get much action—stand mixer, crock pot, coffee maker, electric griddle, rotisserie, waffle maker… The list goes on and on. However, I sense this fall will be different. I’m looking forward to using my kitchen tools for my new creations. I’m envisioning a tender, slow cooked chicken emerging from my crock pot, full of flavor from fresh sage and rosemary, or a moist chocolate-caramel cake topped with a fluffy, mocha infused frosting courtesy of my stand mixer. 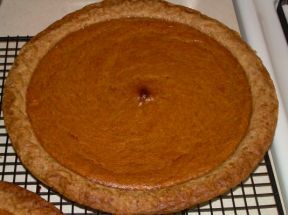 How about a sweet potato pie? Maybe I’ll churn out some rocky road waffles or a chili-lime glazed London broil from my rotisserie. The options are boundless and I’m getting hungry just thinking about it. While my creative side is bubbling to the surface, I’m going to make a list of recipes I’d like to develop (before I forget, ha). I’ll keep you posted on what I cook and will be sure to share some pics. Feel free to share some suggestions for great recipes you have either created or come across. Maybe we can try them together!